The Learning Experience of your Users is largely influenced by the presentation of the Course Content. Although not much thought is put into the aesthetics of a course, an ideal course should follow the ‘4Cs concept for Quality Content. - Clean: Your course pages should be well designed and clean. - Consistent: There should be uniformity in design throughout. - Clear: The course content shouldn’t be cluttered or vague. - Controlled: Your learner should feel in-control throughout the course. The One solution you need to enhance your Course Content Look irrespective of your Moodle Theme! With Two smart course formats, this plugin takes care of the ‘4Cs for you. This is one of the simplest yet enriched layouts for Moodle, Edwiser List Format takes its inspiration from Moodle’s default layout: Topics. Now, with this format, display your course content in the form of collapsible lists. This format also allows Course Creators to display thumbnail images of course teachers. With an intention to add Blocks Design style to Moodle Courses, Card Format is a layout specially designed by Edwiser Team. This layout, like the name suggests, presents your course sections & activities on neatly stacked cards. With this format, learners also get to keep track of their activity-wise progress. Why Edwiser Course Formats is perfect for your Moodle! Gift your users an enhanced learning experience, with the best Course Formats for Moodle! Will this plugin work well with any Moodle theme? Edwiser Course Formats plugin is compatible with Edwiser RemUI, Boost, Fordson, Moove & Handlebar Themes. Will this plugin work on my Moodle site? 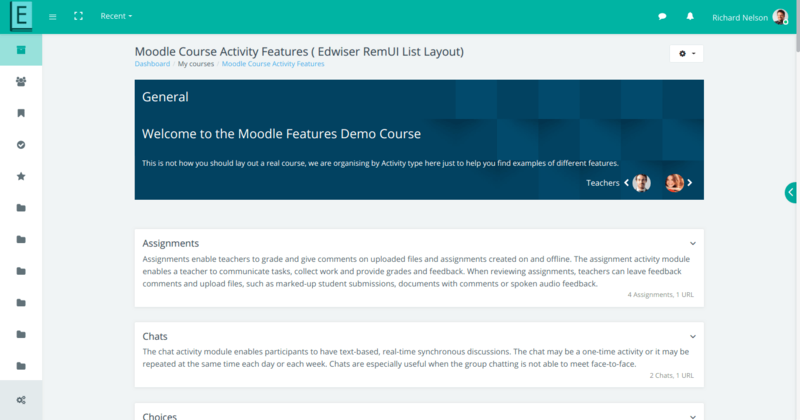 Edwiser Course Formats plugin is built for Moodle versions 3.4 and above! How much do I have to pay to use this plugin? 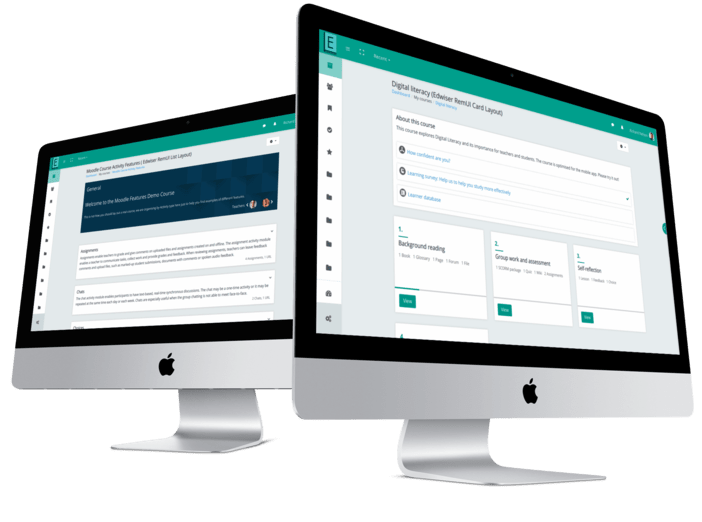 Edwiser Course Formats plugin is absolutely FREE! How many course formats are a part of this plugin? 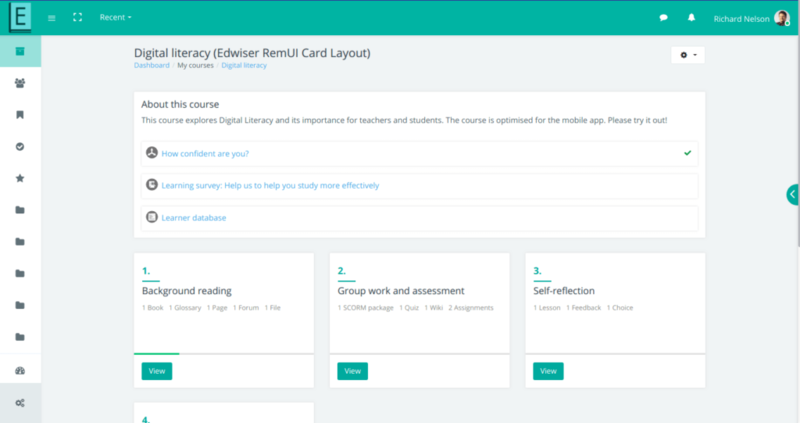 As of now, Edwiser Course Formats plugin comes with Edwiser Card Format & Edwiser List Format. We’ll be adding many more intuitive course formats to this plugin in the near future. Will this product be actively supported? Yes, Edwiser Course Formats is a free-to-use plugin and we will be actively supporting it. You can follow the updates related to the product and also suggest any new course format or improvements as part of “Request a Feature“. My query isn’t listed here. What do I do? Not to worry! Our Support Team would love to help you out!